Interested in Spreading the Word About Time4Learning? We’ll thank you with your choice of a $25 or a free month of Time4Learning! We prefer to pay our existing members for helping us get the word out rather than paying for advertisements. 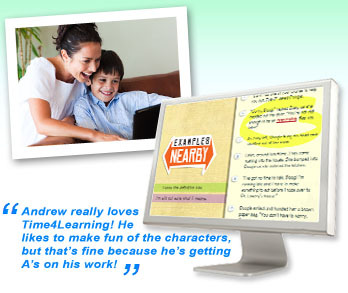 Refer your friends to Time4Learning. We’ll thank you with your choice of a $25 or a free month of Time4Learning when the new family’s trial period is successfully completed. Write a review of Time4Learning. Share your family’s experiences with Time4Learning on your personal blog or website and we’ll send you $25. Other ideas of how to help us? Are you a net-savvy parent? Share your ideas with us on how you could help. We have a number of parents who had good ideas and who now have home-based freelance jobs with Time4Learning. Not yet a Time4Learning member? Well here’s an opportunity for you to try it out FREE for 30 days. Have a personal blog or website? We’ll give you your first 30 days FREE to try the program in exchange for a candid review. Please note: Reviews should be posted on your personal blog or website, which has been active for at least six months and is open for public viewing. Reviews on Facebook, Twitter, forums and sites other than your own are ineligible. All requests are subject to management review, as management reserves the right to limit or restrict the parent review program. To learn more and get started, fill out the new member review form. We ask that all reviewers share their relationship to Time4Learning with their readers. On the form, you’ll also find a disclosure to post. Once all of the required information is received and the disclosure is posted, we will set up your account. This usually takes 24 business hours from the time the form is submitted. We like being able to accommodate our members and can continue to do so within our set marketing budget. We appreciate the ongoing support of our members and appreciate their adherence to our specified guidelines.